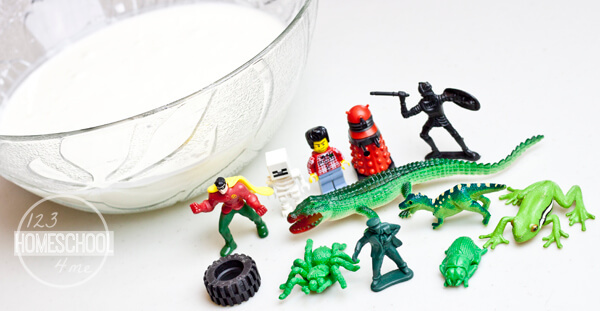 Kids will love mixing up a batch of this to play hide and seek with Oobleck Science Activity. 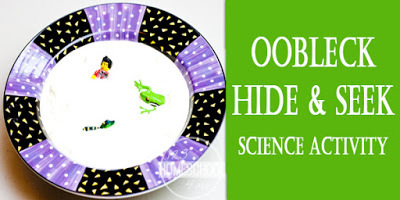 It is a fun science project for kids in Kindergarten on up. Understanding your senses is an important skill for children to develop. Not only does it help with learning and the scientific investigation process, but it also helps children become more aware of their own bodies and develop a sense of mindfulness. With Oobleck Hide & Seek kids learn more about oobleck, a non-Newtonian fluid that is a fascinating exploration of states of matter, plus their sense of touch. This Oobleck Science Activity is fantastic for kindergarten and up. If you have never made oobleck, you are really missing out! 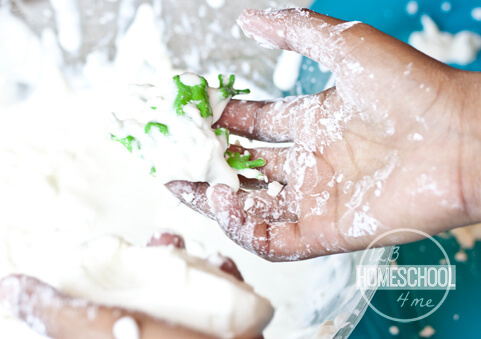 This simple Oobleck Science Activity is fun, easy, inexpensive and keeps kids of all ages mesmerized. To make oobleck mix 2 cups of cornstarch and 1 cup of warm water. Mix it with your hands so you can feel when it is completely blended. Oobleck will become solid under pressure, then behave like a liquid once the pressure is removed. Keep some water and cornstarch nearby so you can adjust as needed to get the perfect consistency. For a game of Oobleck Hide and Seek, pick out a number of small items that can be easily cleaned and will not become damaged by the oobleck. We used a variety of little toys. This activity is focused on exploring the sense of touch. 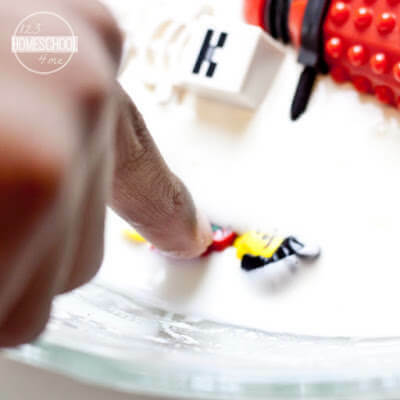 To learn more about the senses and how they work together to tell us about our world, the Senses Detective Activity offers some excellent hands-on learning. Have the children explore the items with their hands. Ask them to close their eyes and try to memorize how each item feels. Then, once they are finished with an item add it to the oobleck. What happens to the items? Do they sink or float? Try to push the items down. What happens? With many items, what you should notice is that if you suddenly push really hard, the items won’t go down. That’s because the oobleck is becoming solid under pressure. The items won’t move through the solid substance. To get the objects to submerse, gentle pressure should be used. Once the items are in the oobleck, have the children close their eyes, spin the bowl around, then have them search for items in the oobleck. 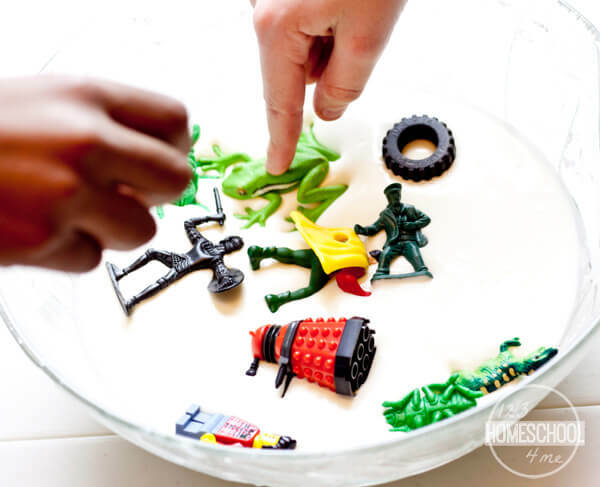 It can be a big challenge finding the items because as the kids grab at the oobleck it encases the objects in a solid, play dough like substance. Let them explore the best ways to find, uncover and identify the items. As they do this they will be learning about their sense of touch and how their touch can affect things (turning the oobleck solid). The science behind oobleck is called shear thickening. Shear thickening is a process that occurs in materials made up of microscopic solid particles (the cornstarch) suspended in a fluid (the water). The cornstarch is not dissolving when you mix it into the water, it is simply suspended. When pressure is applied, the water is pushed quickly out of the way, leaving the cornstarch tightly packed which creates a sense of being solid. When the pressure lessens or is removed completely, the cornstarch has time to move out of the way and flow with the water as a liquid. Glow in the Dark Oobleck? Oobleck is messy and hard to clean up due to it’s elusive solid/liquid nature. Drape the area to help with clean up. Never put oobleck down the drain. Scrape it into a garbage bag and dispose of it that way. Your pipes will thank you! Oobleck is non-toxic, but still not recommended for children too young to understand not to eat it.